Inspired by the book of the same name by Jana Kolpen and Mary Tiegreen, Circle of Kindness brings the gently and welcoming spirit of the Irish countryside to your table. Based on the Aesop's quote, "No act of kindness, however small, is ever wasted", the book plays out the humanitarian premise that one good deed begets another to create a "circle of kindness". Each piece of this collection expresses the magic of the simple, giving way of life. This stew pot is especially versatile during fall & winter. You can serve piping hot soups and stews, as well as spiced cider or chilled punch. At Merriweather Cottage, the generosity of spirit and a love of good food makes every meal in Ireland a special occasion. The Shanagary Irish Stew Pot is a great addition to your dinnerware collection. 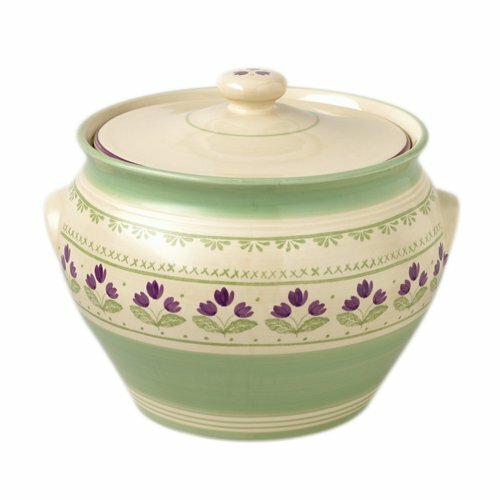 Serve your favorite stew or soup from this beautiful crock. A beautiful pattern based on an enchanting story of kindness inspired by the book of the same name, written by Jana Kolpen and Mary Tiegreen. Made of durable, chip resistant stoneware. Microwave, dishwasher and oven safe.